Open books and open minds on a visit to the public library! 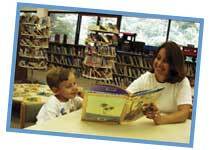 Perhaps there’s no better place to introduce a young child to the important world of reading than a library. Low shelves, attractive book displays, child-sized seating, and special story times are some of the features that make a library’s children’s department a wonderful place to plant and nurture a lifelong love of books. 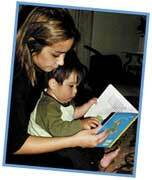 Sharing new storybooks with mom is part of the fun. Colorful illustrations add to the enjoyment and understanding of picture books. 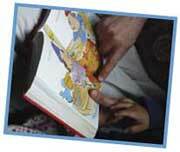 A children's librarian uses songs, puppets, and other props to introduce new stories to groups of children. Sample stories before deciding which ones to borrow and take home. Some libraries give children opportunities to use computers. 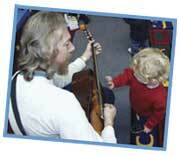 Special performances for children are a fun feature of many children's libraries.